I understand the hesitancy among nail techs (and myself, to be honest, at least until I saw the salon in person) about the in-store experience at the nail salon that just opened inside a Chicago Walgreens. Where would the nail salon be located? Not next to the pharmacy counter, I hope! 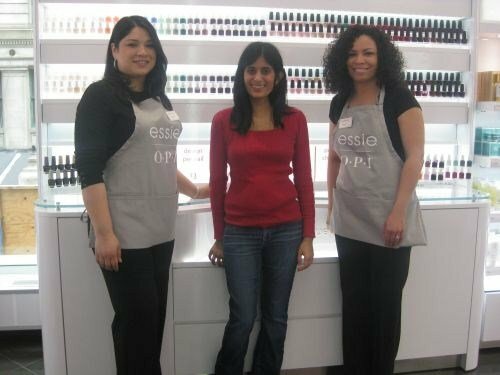 Well, during my trip to Chicago for America’s Beauty Show, I visited the salon (officially known as the Nail Bar by Essie and OPI) and I have to say that it is beautiful, clean, and professional. The entire Walgreens, actually, is pretty sweet. The store manager showed me a bottle of brandy for sale that’s priced at $1,999.99. More in my price range is the fresh sushi bar (complete with a sushi chef) and made-to-order smoothie bar. 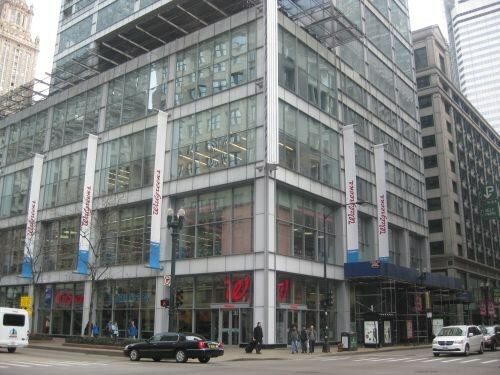 The salon is located on the second floor of this two-story Walgreens (at the intersection of State and Randolph; those of you in Chicago should check it out) in a nook in the back. To get to it, I first walked through the LOOK Boutique, which features nail, skin care, and hair care products, so it already put me in a beauty mindset. 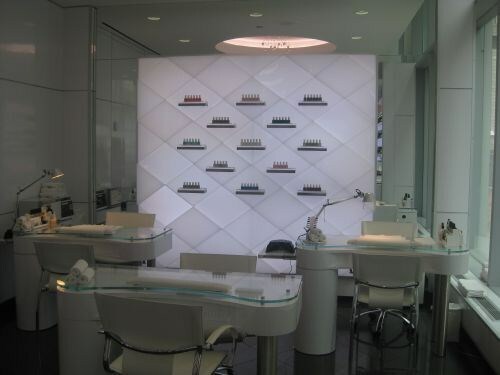 Then, I arrived at the salon, which looks modern and feels private from the rest of the store. I’ll write more about it in an upcoming issue of NAILS (most likely our June issue), but in the meantime, I wanted to share some of my photos. 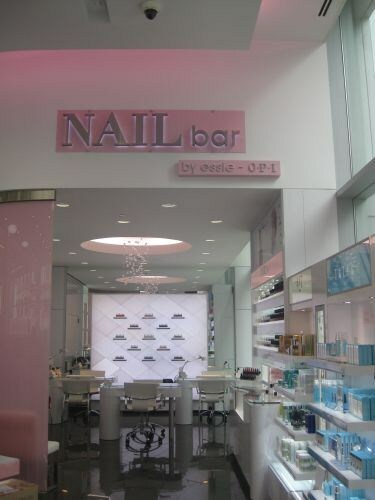 When it comes to this nail bar, I feel like you really have to see it to believe it. 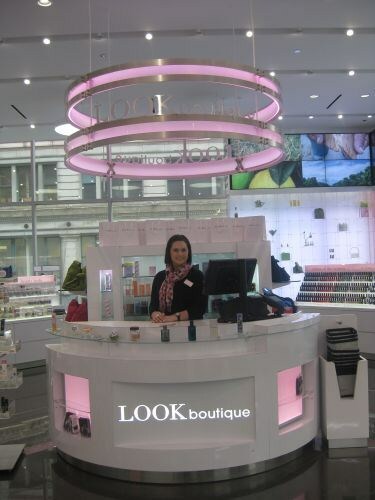 LOOK Boutique Advisor Brittany Green manages the professional beauty area. Licensed nail techs Stacey Hernandez and Katherine Walker don black apparel with gray salon-provided aprons as their salon uniforms. I loved the modern look, especially the two bubbly chandeliers. 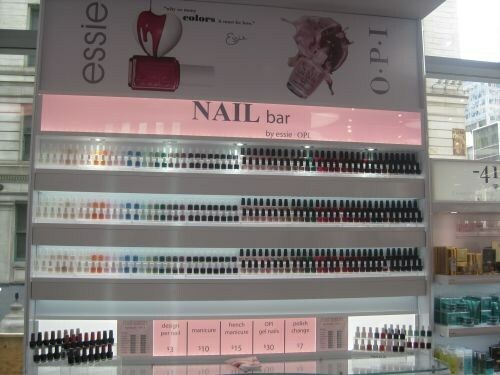 That nail polish display on the back wall is changed out to reflect new color releases. The bottom two rows are for clients to pick their polish. The top row is for retail.